Aside from the usual seriousness to roll out of the house of Rolex, the brand is not above being playful/colorful with at least one creation on any given year. For 2018, the iconic Rolex Daytona gets a particularly elaborate treatment, featuring a rainbow-colored setting of natural sapphires on its bezel, and diamond setting throughout the balance of its case. 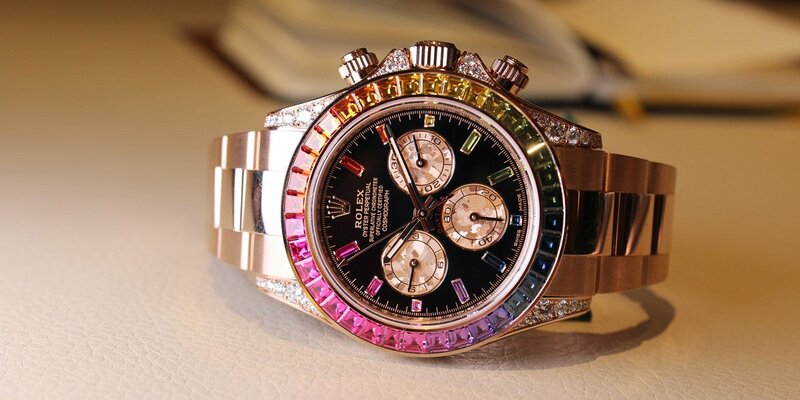 The newest Rainbow Daytona 116595RBOW has a few key updates. Priced starting at $96,900 (and increasing from there with the options of a diamond-set dial, or a diamond-set bracelet), this vibrant creation is another prime example of Rolex’s dedication to perfect execution in all forms. A close examination of the stone setting of the bezel reveals a brutally consistent transition from one stone to the next—not an easy task when using natural sapphires whose coloration can be consistently inconsistent. The diamond stone setting throughout the balance of the case, which uses a total of 56 brilliant-cut diamonds, reveals another layer of consistency in execution, with each lug and each crown guard being mirrored with the a matching setting to its opposite side. 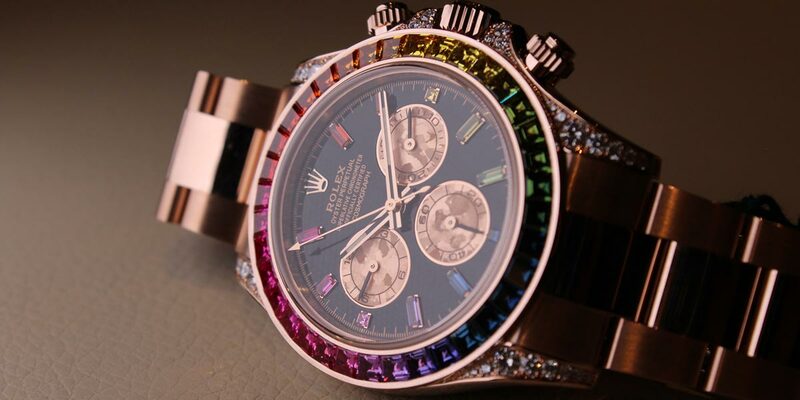 As a final detail (as if the “Rainbow” needed more details), its subdials feature a very distinct texture created by the crystallization of a pink gold alloy—a special process developed by Rolex specifically to create this unique visual cue that has been seen in a handful of special models through the years. Another success for the Rolex Daytona series. 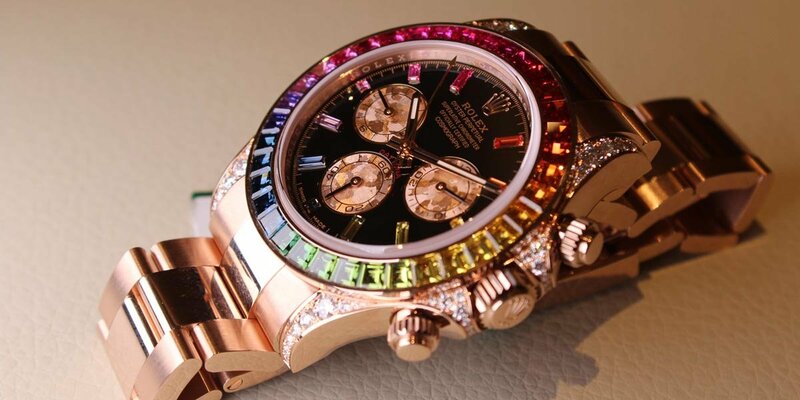 Rolex was somehow able to make another iteration of the Rainbow Daytona. Last year’s boundary-pushing release from Rolex came in the form of a sapphire gem-set bezel on an Everose Yacht-Master, which when compared to this new Daytona was a walk in the park. Rather than going gradient, the Yacht-Master’s bezel followed a consistent contrasting pattern all around, and its case was devoid of setting. With this new Cosmograph Daytona, the “entry model” (if you will) features diamonds in a snow setting on its lugs and crown guards, adding another hefty touch of sparkle. Though not catalog items for Rolex, we were told during our appointment that two other more significant models would also be made available should prospective clients be interested—a model with a completely diamond-set Oyster bracelet, and one more that adds a diamond-set dial to the equation as well. I suppose if you’re going to go for something iced-out to that level, it may as well come direct from Rolex HQ, right? Getting back to the model that actually passed through our hands, we were immediately floored by how perfect the execution of the Cosmograph Daytona’s bezel really is. The closer you look at the elaborate gradient stone setting of the bezel, the more you come to realize how brutally consistent each color transition is from one stone to the next—not an easy task when using natural sapphires, whose coloration can be consistently inconsistent. The diamond stone setting throughout the balance of the case, which uses a total of 56 brilliant-cut diamonds, reveals another layer of consistency in execution, with each lug and each crown guard being mirrored with the a matching setting to its opposite side. As a final detail (as if the “Rainbow” needed more details), its subdials feature a very distinct texture created by the crystallization of a pink gold alloy—a special process developed by Rolex specifically to create this unique visual cue that has been seen in a handful of special models through the years. Focus on the colors of the gems in this image. Under its less-than-austere skin beats Rolex’s much-beloved caliber 4130 chronograph movement—a true benchmark in the category. As with the entire Rolex model range (as of 2016), the Daytona’s caliber is regulated and tested to ensure its timekeeping is between +2/-2 seconds per day. As a point of reference, this is more stringent than the now “industry standard” COSC certification, which tests movements before they’ve been cased, and allows a deviation of -4/+6 per day by comparison. The self-winding caliber delivers a 72-hour power reserve, and of course uses the brand’s Parachrom hairspring to aid in shock resistance, temperature resistance, and overall accuracy. Though still a fairly cutting-edge caliber, the 4130 (which by the way was Rolex’s first in-house chronograph caliber) is now 18 years old, and theoretically due for a refresh. Now, while we’re the first to side with the “if it ain’t broke, don’t fix it” mantra in watchmaking, we’re genuinely curious to see how much further Rolex could push the Daytona caliber. Their new Chronergy escapement is touted as being significantly capable of increasing overall efficiency in the calibers it has been installed in, and combined with the mainspring barrel modifications applied to all of the 32XX series calibers, we could be looking at a future Daytona caliber with a power reserve somewhere north of 100-hours. Don’t get me wrong, I’d be more than content with the current steel 116500LN Daytona any day of the week, but it’s hard not to think about the possibilities that may come sometime down the road. Once again looping back to the watch at hand, these obscurities from the mighty house of Rolex are always such a fascinating design exercise. So obscure, so polarizing, and oft equated to the use of leopard print in home design. They sure won’t be for everyone, but for that outside-the-box Rolex buyer who just wants a little whimsy (and a whole lot of bling) on their wrist, this gemmed out Rolex Daytona makes for the perfect fit.